Celebrating a 90th birthday party is a truly joyful occasion for a father. Living almost a century of life is an achievement and a landmark worthy of note. While every celebration does not have to be a surprise party, you should do all you can to make it a stress-free day for the birthday honoree. Do all you can to ensure the celebrant has to do nothing but show up and enjoy his special day. When you're 90 years old, any physical or mental stress can be an unpleasant experience. 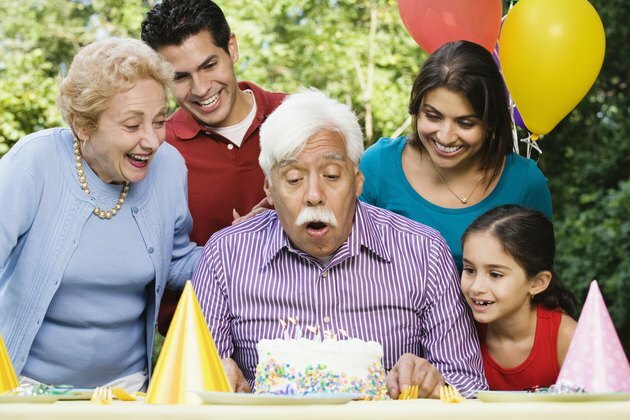 Start your planning early for a 90th birthday celebration. A person acquires a lot of friends over 90 years, and the honoree's children many may need to take time off work and make travel arrangements to attend. Advise traveling guests of hotels or make other accommodation arrangements for them if you can. Schedule your party at the best time of day for all guests. The Special Speeches website suggests that you should consider older friends or relatives who will not enjoy staying up late at night. They will likely be more comfortable traveling to and from the party location in the daylight, especially if they are driving. Decorate the party location with photographs of the children, and pleasant memories for the birthday honoree. The My Party Planner website explains that along with old photographs and memorabilia, a photograph birthday cake or an inflatable 90th birthday Mylar are good ways to decorate the party location. Adopt a theme for the 90th birthday party to add some originality and flair to the event. The Themed Party Ideas website suggests the 40s era or a family reunion as potential 90th birthday themes. Make the decorations, food and even dress code all appropriate to really capture the mood and theme of the event. Many guests will enjoy wearing old-fashioned clothes and eating their favorite foods from another time. Take the weather into account, as many elderly guests will be in attendance who may not be as resilient as some people when it comes to heat or rain. Provide fans and cooling in the heat, or shelter if you are anticipating rain. Set up entertainment that elderly guests will enjoy at a 90th birthday party. The Themed Party Ideas website suggests board games such as Uno, dominoes, Scrabble and checkers as good forms of 90th birthday party entertainment. Create a souvenir guest book for the birthday boy to remember a special day. Ask the guests to sign the book, and contact them beforehand to bring any photographs they may have of the birthday honoree to include in the book. Have the children hand it over as a birthday gift to their father at the end of the night.